Many articles about the Eastern Trail are organized on this news archives page. The most recent articles appear immediately below, with the first part of each article displayed. Click on any article title, or the "Read More.." link to read the full text of that article. A list of additional article titles appears at the bottom of the page. Two years ago, we were contacted by a rider who was writing a book about losing weight. The ride had already sold out, but he wanted to be part of the event, and promised if we "snuck him in" he would mention the MLR in his book. The children of Dr. Philip Thompson made the contribution to the Eastern Trail Alliance to celebrate his 100th birthday. 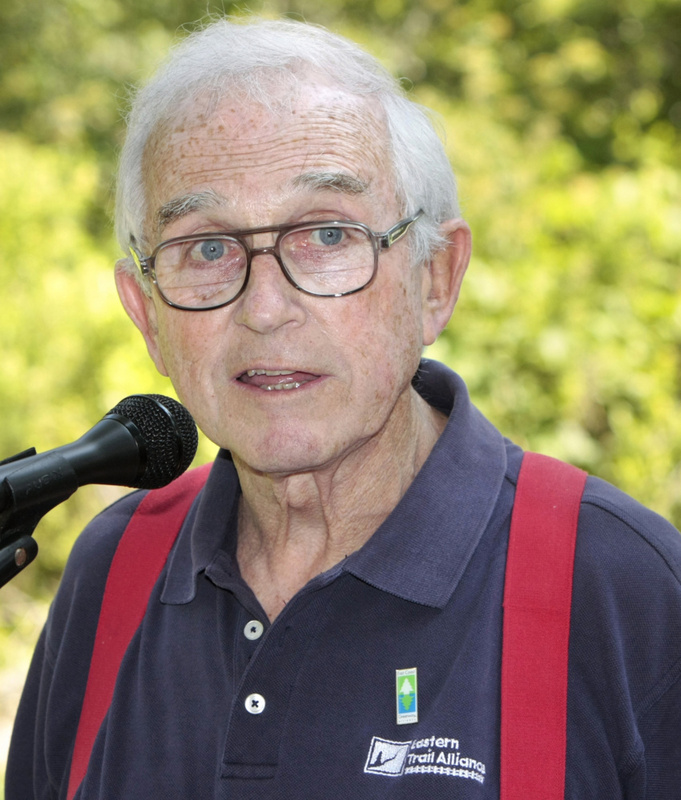 The children of Dr. Philip Thompson, a retired rheumatologist who celebrated his 100th birthday last weekend, have donated $25,000 in his honor to the “Close the Gap” campaign of the Eastern Trail Alliance. The alliance is raising $3.8 million to complete a 1.6-mile, off-road section of the recreational trail in Scarborough, including bridges over the Nonesuch River near Eastern Road and railroad tracks near Pleasant Hill Road. The founder of the Eastern Trail Alliance remembered as a patience, persistence and passionate outdoor leader. In the nearly 20 years I’ve reported on the Maine outdoors, there were three times I nearly cried while working. Once was when I was telling a civic group a story about a young man who was dying of cancer who came to Maine to hunt. The second was late at night while doing a phone interview for an obituary. And the third was standing in the Arundel woods listening to John Andrews talk about the Eastern Trail. BIDDEFORD/SACO – When University of New England professor Noah Perlut first heard about upcoming construction happening on the Eastern Trail, he knew he wanted to conduct some kind of study on it, and he has finally found the right time to do so. The director of the Eastern Trail Alliance says that without Andrews' efforts, the 65-mile trail from Kittery to South Portland wouldn't exist. YORK COUNTY —Bikers and hikers of York County may have a new trail to traverse in another year, as actions to extend the Eastern Trail in York County have picked up momentum. SCARBOROUGH — The Eastern Trail Alliance is just under $600,000 away from starting a 1.6-mile Close the Gap project. The alliance has already raised more than $3.2 million towards the $3.8 million project, closing in on the funding needed to make the proposal a reality. The funding must be in place before construction can begin. Alliance representatives said construction won’t begin until 2018. Town & Country Federal Credit Union announced that it will make the largest philanthropic gift in credit union history to the Eastern Trail Alliance’s Close the Gap campaign. The group is closing in on a financial target to construct a difficult portion of an envisioned 64-mile path. SCARBOROUGH — The Eastern Trail Alliance announced Tuesday that it is close to a fundraising goal that would allow the trail to run 16 miles uninterrupted from Bug Light in South Portland to Saco. The ambitious Eastern Trail project will add another key component next year, as work begins on a 1.6 mile section to connect South Portland and Scarborough. SCARBOROUGH — While the first frigid gusts of winter swept across the Scarborough Marsh last week, Janice Cohen had warmer thoughts as she walked her black Labrador, Abe, along the Eastern Trail. When Cohen learned the trail would be extended, she stopped to envision the impact.